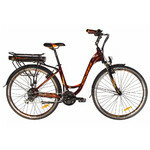 Bafang drive on front wheel, up to 120 km distance range, suspension fork, number of accessories, suitable for adults and seniors. 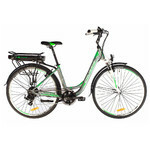 Suitable for adults and seniors, Urban E-Bike Devron 28120 28” – 2017 is a modern e-bike with an aluminium frame, 28” wheels and a front wheel drive. The lowered frame allows the rider to get on and off easily. 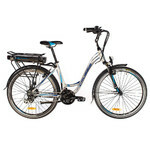 The 250W Bafang drive allows for a smooth ride while the 13Ah battery (placed under the rear carrier) provides a distance range of up to 120 km (depending on the trail profile and the use of assistance). Offering several assistance modes, the drive stops when you reach the 25kph speed to keep you safe. 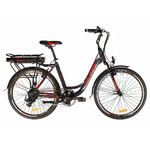 Urban E-Bike Devron 28120 20” – 2017 also has top-quality features such as a Suntour suspension fork, reliable Tektro V-brakes, top quality Mitas tires, reflective aluminium rims for better visibility and Shimano grip gear shifter. 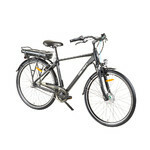 What's more, this bike also has the following functional and safety features: front and rear lights, mudguards, a rear carrier, kickstand and chain guard. You may also appreciate the ergonomic seat and soft handlebar grips. Urban E-Bike Devron 28120 20” – 2017 is perfect for everyday urban riding, commute to work or shopping rides. Front light is white and can have the form of a classic bulb with high energy consumpion or a more expensive diode light. Some models offer several lighting modes. It is compulsory to have a front light under worsened visibility conditions. The rear light is red and usually uses diodes. Higher level models have several modes, such as constant light, flashing of all diodes or alternating between separate diodes. In worsened visibility conditions, rear light is required by law. 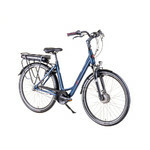 Plastic or metal mudguards for the front and rear wheel. Their purpose is to protect the cyclist against mud and water splashing from the revolving wheel. Mudguards are not often used on mountain bikes (however, there are special mudguards for this purpose), so that the mud glued to the wheels wouldn't rub against them. The front mudguard is attached to the fork, on mountain bikes it can be also attached to the frame. The rear mudguard is affixed to the frame near the centre and to the rear fork under the saddle. On mountain bikes, the rear mudguard is attached under the seat post (approx. 20 cm above the wheel).